Christopher William Stoneking was born in Australia in 1974 and still lives there today, but he couldn’t sound more ‘authentic’ if he’d been next door neighbours with Leadbelly and Robert Johnson in deepest Mississippi in the 1930’s. 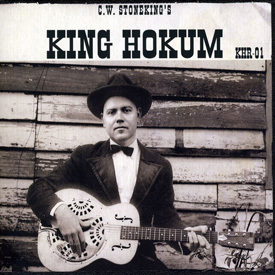 Everything about the UK release (on Stoneking’s own label) of CW’s debut album creaks of the early 20th Century apart from the crystal clear sound. CW’s lazy drawl makes him sound like an amalgam of the original Delta Blues singers and he even uses National Reso-phonic guitars because they are what Son House and Bukka White used. Many years ago I used to listen to a lot of this type of music when I first discovered ‘the Blues’ but soon grew out of it because I didn’t think that it had aged very well and after listening to HOKUM BLUES I’m still not convinced it has. Several songs are quite good – Going the Country, Charley Bostock’s Blues and the New Orleans flavoured Handyman Blues but there is an all pervading sense that this is all just a theatrical act trying to pass itself off as something quite original. After several listenings Charley Bostock’s Blues is by far the best track on the album as CW recounts his young friends’ funeral and how it affected so many different people in their circle. CW Stoneking certainly looks and sound ‘the part’ and I’m led to believe he is very entertaining in concert; but these days re-mastered albums by the legendary Blues singers can be picked up cheap enough and probably will be; instead of this. But then again; I said that about Seasick Steve!